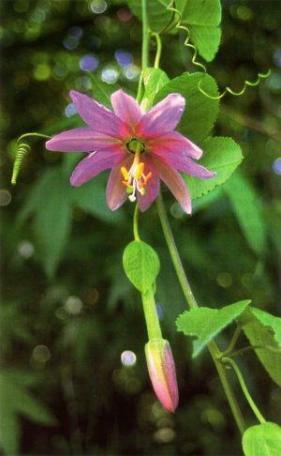 A large, vigorous, scrambling, smothering, evergreen perennial vine climbing up to 10 m high by means of its tendrils. The flowers are large and pink. Fruits are green, ripening to long, thin yellow passion-fruits. Flowers Hanging singly, pink, up to 7 cm in diameter. Flower tube 80-95 mm long, long in relation to perianth lobes. Flowers Jan-Dec.
Fruit Green, turning yellow when ripe, up to 12 cm long by 3 cm across, thin-skinned, sweet, with orange edible pulp. Leaves Three-lobed with lobes 5-14 cm long, middle lobe the largest, toothed. Toothed kidney-shaped stipules up to 30 mm wide with a tapering, awl-shaped apex. Stems Densely hairy. Young shoots are weakly-angled. Hedges, trees, plantations, forest margins and waste places. Passiflora tripartita var. mollissima (formerly Passiflora mollissima) has upper leaf surfaces moderately to densely covered in short hairs, and is found in scattered NI localities, especially in Wellington, and in Marlborough and Nelson in SI. Passiflora tripartita var. azuayensis (formerly Passiflora mixta) has upper leaf surfaces hairless or almost so, and is most commonly found in Wellington, Canterbury and Otago. Both originally from tropical South America. Passiflora tarminiana, also previously classified as Passiflora mixta, is commonest in northern NI and is similar to Passiflora tripartita, but with small, deciduous stipules, a shorter floral tube, longer petal/sepal lobes, and spindle-shaped fruit. It is also less hairy and has paler pink flowers. True Passiflora mixta is only known from the Waitakere Ranges in western Auckland and one site in Marlborough. This species has a hairy floral tube and salmon-pink flowers. Blue passion-flower (Passiflora caerulea) has five-lobed leaves, non-tubular white flowers with a ring of purple filaments, up to 9 cm across, and round yellow fruit up to 9 cm in diameter. 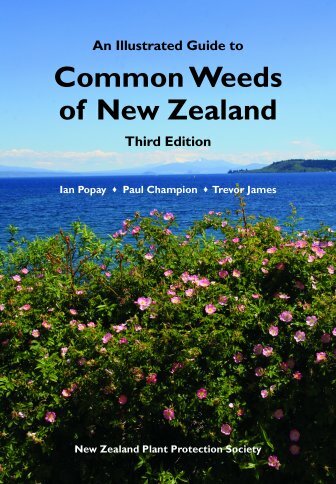 It occurs on forest margins, scrub and hedgerows from North Auckland to coastal Otago. Banana passion-fruit and northern banana passion-fruit are listed on the National Pest Plant Accord (see Introduction for details). Both banana passion-fruit and blue passion-flower are subject to Pest Plant Management Strategies in several regions of NZ. Details are available from individual regional councils or unitary authorities. Passiflora (Lat.) = passion flower; tripartita (Lat.) = having three parts; mollissima (Lat.) = very soft; azuayensis from Azuay, a province in southern central Ecuador.